Gustavo García de Paredes will leave behind a student body that for the most part disdains him and “student leaders” of little relevance because they bought into his political patronage scheme. Most tenured professors and virtually all non-academic employees owe their jobs to him and that will affect the succession process. Archive photo by Eric Jackson. On the morning of October 29, as part of a brief “state of the university” presentation to University of Panama faculty and staff, Gustvo García de Paredes announced that he will desist from his plans to seek a sixth term as rector in next year’s elections. Laws could change and the course of events could accelerate, but at this point it looks like the next rector will be elected next June and take office on September 1, 2016. The Lebanese-born machine politician has always thrived in rigged systems. Back in 1938 when he was born, that country was a French dependency, the State of Greater Lebanon, gerrymandered to create a Maronite Christian majority — which has proven to be ephemeral — in a part of the old Ottoman Empire that France and the United Kingdom had divided between themselves. But Gustavo García de Paredes was Panamanian as well as international and by the time he was ready for university studies he went to Francisco Franco’s Spain. There, the venerable old University of Madrid, established by royal decree in 1293 and now known as the Complutense, had been degraded by the generalisimo and was in part financed by the sale of advanced degrees to foreigners. García de Paredes studied philosophy there and got his licenciatura in 1962. He claims to have received a doctorate from the same university in 1963. So, all the studies for a doctorate in one year? Actually, no. A purchased doctorate from the Franco-era university yielded a diploma that looked like a legitimate one, and would be noted the same as an earned doctorate by the registrar. But those who actually earned doctorates had to write and defend dissertation, and upon successfully doing this a copy of their dissertation would be bound and put into the university library stacks at the university’s expense, and listed in the library’s catalog. You won’t find a Gustavo García de Paredes dissertation or a catalog entry for such at the Complutense. The man’s doctorate is fake. So, what’s a guy with a fake degree to do? Certainly not to embark on a career of publishing learned articles in peer-reviewed academic journals. That has never been where “Dr.” García de Paredes was at. But an academic opportunity began to unfold for him on October 11, 1968, when Guardia Nacional officers led by Boris Martínez and Omar Torrijos toppled the elected government of Dr. Arnulfo Arias that had taken office a week and a half earlier. The University of Panama, a hotbed of both that sort of radicalism that would turn into underground, exiled and imprisoned resistance all through the more than 21 years of military rule and that sort of radicalism that would give due consideration to whatever offer a non-radical government might make, was closed. When it reopened some of the faculty and part of the student body had been eliminated, and opportunity beckoned for Gustavo García de Paredes. In 1970 he was made dean of the philosophy department. There were detours from the climb up the ladder of university office politics. Under the dictatorship García de Paredes variously served as head of the national lottery, director of the Colon Free Zone, minister of education and Panama’s ambassador to Brazil. After the US invasion that brought down the dictatorship, García de Paredes served on the board of directors of the old Interoceanic Regional Authority (ARI), which oversaw the mad scramble for the reverted real estate and other assets of the old Canal Zone. In 1994 García de Paredes became rector of the University of Panama. Except for one interregnum in which he left the post in the hands of a protege proxy — against whom he then turned — he has run the university ever since. In the speech in which he said he won’t run again, the Rector Magnifico — an honorific he bestowed upon himself — complained that the courts had interfered with his ability to fire faculty dissidents. While that may be true, over a generation his control over who gets hired has transformed the faculty into a cog in a political patronage machine that despite some excellent professors has put the University of Panama off of all international lists of Latin America’s better institutions of higher learning. Because Panamanian law gives the University of Panama’s Faculty Council the power to charter and approve or reject that courses offered at all of the nation’s other universities, the Rector Magnifico’s influence has served to spread the contagion of academic fraud all through Panama’s higher education system. The situation is notorious and has continued thanks to successive legislatures that have been willing to act or refrain from acting as García de Paredes requests. 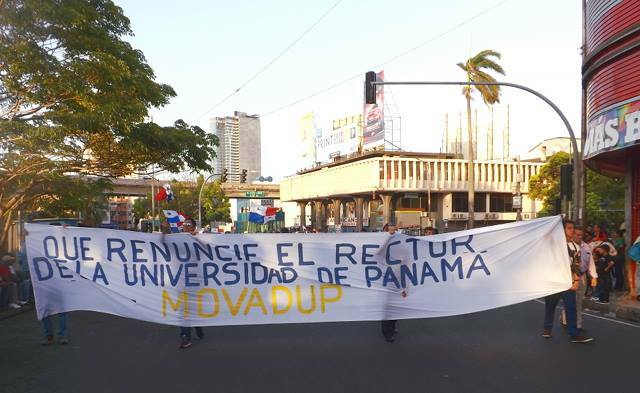 Can the University of Panama withstand outside scrutiny, and should it? Under the banner of “academic freedom” the rector has resisted the comptroller general’s attempts to audit the public university, and particularly to scrutinize the dealings of a private foundation into which many private grants, fees charged by the university, aid transfers from foreign governments and other sources of university revenue have been poured by García de Paredes. The Varela administration blocked the rector’s attempt to buy an unsuitable tract of land in Chepo to supposedly replace the agricultural school’s experimental farm in Tocumen and critics are demanding to see the books on a generation’s worth of secretive real estate transaction, many of them with land bequeathed to the university by alumni. If Comptroller General Federico Humbert does not publish the findings of his auditors, look for some litigation pursuant to Panama’s transparency laws about that. The rector says that he won’t designate a successor, but if nothing else changes it’s hard to see how the votes of faculty and staff who have been loyal to him will not determine who comes next. The political patronage machine may unify behind a successor or break into rival factions before the official nominating process for the next rector begins in March of next year.